I recently discovered an online store called Style Moi and I'm in love! Headquartered in Hong Kong, Style Moi offers a wide selection of clothing in various styles categorized into segments like casual, bohemian, grunge, retro, contemporary and much more. Style Moi isn't just a store because theirs is a site where one can not just shop but also find fashion inspiration. With its Pinterest like visual style, the site lets you explore the magic of street style fashion created by real people around the world. Instead of showcasing items for sale, their focus is on showing us the style of talented trendsetters around the world. They’ve partnered up with many of the street-style bloggers to create specially curated lookbooks for the site. I love all things fringe and I already have a fringed bag, cami, kimono and a skirt is on the way so this black cropped fringed jacket is something I need to complete my fringe addiction! You can team it with this Bralet with scallop frill hem the way she has. Finish the look with lace trimmed shorts and you have a badass rocker chic outfit! This romantic Bohemian off-shoulder dress is perfect for the summer. It has an adorable flower child vibe thanks to its bishop sleeves and its sheer embroidery detail. I've always been a huge fan of 70s fashion because it was one helluva stylish era and this outfit channels exactly that with this Bell sleeved crop top and Lace up shorts. So retro and so stylish. I've spoken about my love for kimonos and black and white a million times, so this Tie Dye Kimono was probably made for me. Whether you throw it on over a dress of team it with shorts and a cropped bustier or wear it as a swimsuit coverup, a kimono is always perfect! So these were some of my favorites from Style Moi. Just check out the site and in one glance you'll realize how unique they are compared to all the other stores in the market. They have free shipping worldwide too! I can guarantee you that you won't be disappointed! At Style Moi, there's something for everyone. They have a very cool and refreshing marketing strategy. I like that a lot and thanks for sharing June :). I can see it's a very good shop! That off the shoulder dress in lace is so sweet and beautiful, I would love to get it! And the price is very good, too, very reasonable! Great find! So pretty selection and fashionable too! Wow, everything that I've seen looks like something I would wear! I love your picks! Thanks for sharing... going to check them out! I really fell in love with this boho style this year. Looks so free and chic. Great selection June. Have a nice day! Will surely check out this website :) Lovely post..Keep In touch dear..
Those lace trim shorts and that off the shoulder dress are beautiful, I'm definitely checking out this site! Good website. Nice products to offer. I love that off the shoulder dress. So pretty! I love your picks, June:) These outfits are all very cool! I really like the off the shoulder dress! OMG.... I am in Hong Kong next month.......... literally HAVE to go here!!!!!!!!! GORGEOUS clothing June!! I can picture you wearing a lot of these things, but don't think they´d suit me very well. I love off the shoulder dresses! Oh wow, what a lovely collection of bohemian attires! What a cool website!!! love the outfit inspiration, I'm dying for a head piece like the one you showed! thanks for sharing lovely! 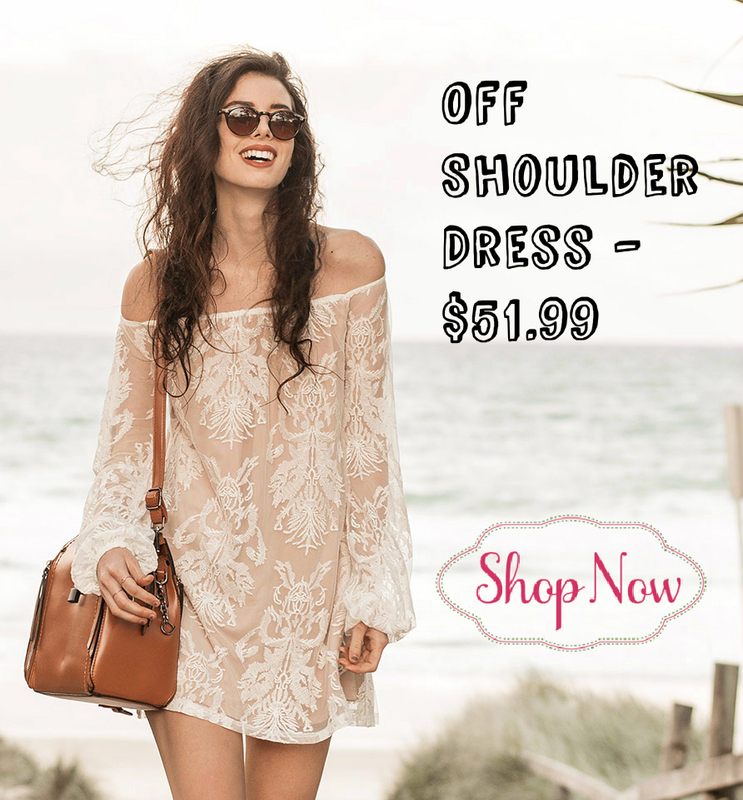 Love the bohemian off the shoulder dress! Adorable! Marvelous styles ! This off shoulder dress is gorgeous. Well spoted perfect summer looks! I love the all!! !